What started out as Annie's birthday party has grown beyond my expectations. 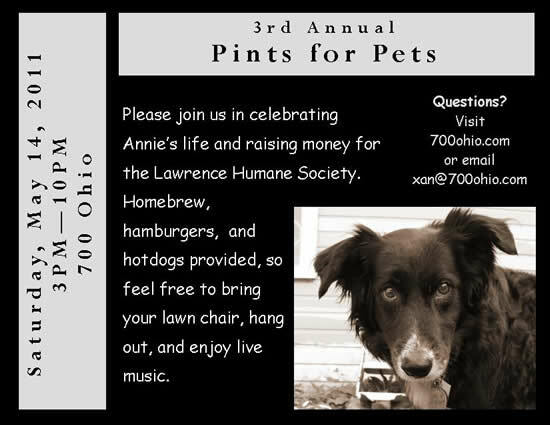 We have now raised an accummulated total of $21,815 for the Lawrence Humane Society due to the generousity of our neighbors, family, and friends (many who are part of the Lawrence Brewers Guild and donate the beer for this event)! THANK YOU! Thanks to everyone who attended and donated beer, food, and $ this year! We raised $3,403 for the Lawrence Humane Society! Thanks to everyone who attended and donated beer, food, and $ this year! We raised $3,026 $3,116 for the Lawrence Humane Society! Thanks to everyone who attended this year! We raised $3,374 $3,419 for the Lawrence Humane Society! Thank to everyone who attended and/helped us in raising $3,108 for the Lawrence Humane Society! 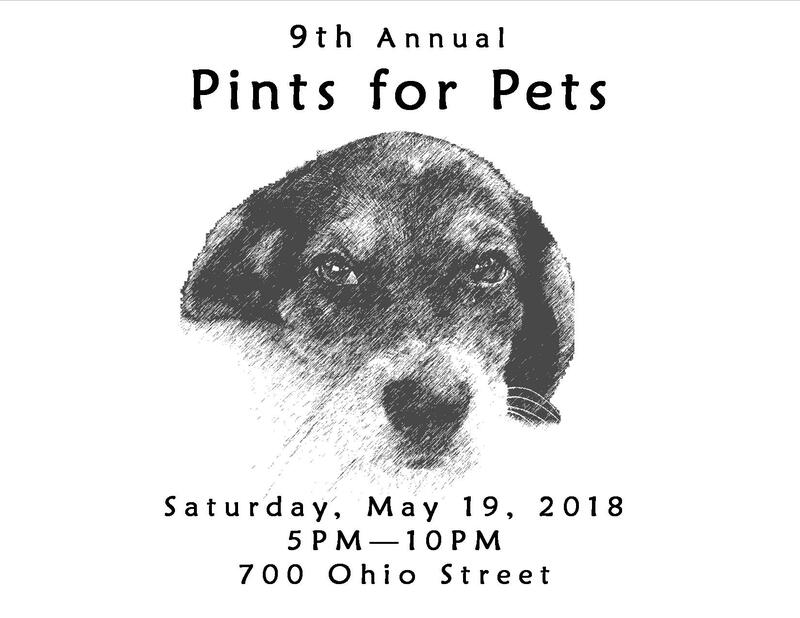 Pints for Pets is on hiatus due to House Bill 2223. HB2223 is an attempt to clarify the legality of sharing homebrew with guests. The bill is currently in committee (May 2013). Please contact your representatives and ask them to support this bill. You can find your elected officials at: http://www.openkansas.org/. 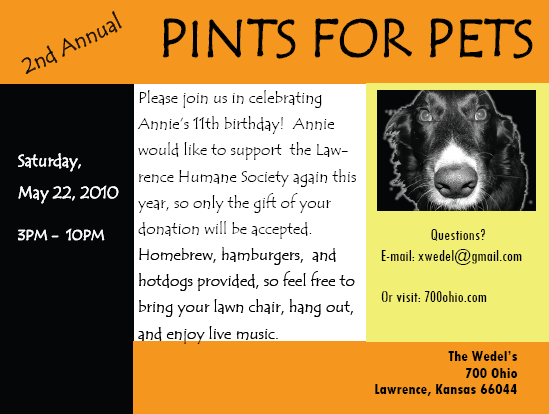 We hope legislation, either HB2223 or another bill, will pass and we can resume Pints for Pets next year. In the interim, please continue to give your support to the Lawrence Humane Society. Thanks to everyone who helped make this year a success! We raised $2,176 for the Lawrence Humane Society. Thanks to everyone who helped make this year another success! We raised $1,863 $1,971 $2,011 for the Lawrence Humane Society! Special thanks go to Tres Mexicanos for the tortilla chips, Anglers and Worldwide Wine & Spirits for beer donations, as well as Bryan Newberry, Eddie Glenn, and Bob Cross for some great entertainment. 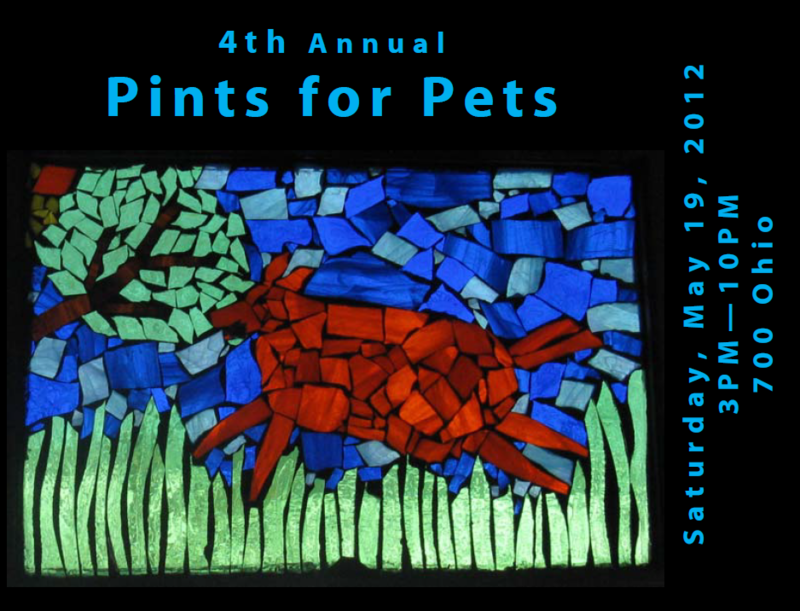 Thanks to everyone who made Pints for Pets a success!!! We raised $1,500 plus supplies and food for the Lawrence Humane Society. Live music was provided by Eddie Glenn and The Wise Acres.